It is hard to find people to align with to work together for a common purpose. It is important that people have the same vision or it will be difficult to make any progress. The right heart is also important, because working together for some goal or project is done well when people respect each other. In 2 Kings 10, we read about Jehu and Jehonadad. Ahab’s family was just killed. Jehu left in his chariot and met Jehonadad who was coming to meet him. Jehu “greeted him” or “saluted him.” The word used is “barak,” which means “blessed” or “kneel down.” He showed respect and affection. Jehu then asks Jehonadab if his heart is right, because if he was going to join him with his mission, he would need to have his heart right with him. We see that Jehonadab says his heart is right and Jehu asks for his hand and allows him to join his chariot. No longer is it Jehu alone with this mission forward. He now is joined in this endeavor. It is important to work together with each other. It is also important that, if we work together, we share in a common goal with a right heart. When it comes to ministry, a right heart is a heart devoted to Jesus. When we come together devoted for Jesus Christ, we find that, just as His Word says, we can do greater things (John 14:12). When the prophet Elijah met with Ahab, there is an exchange that speaks volumes. Ahab says to Elijah, “So, my enemy, you have found me!” He is called an enemy. Elijah an enemy? He is a prophet of the Lord. He was used by God to raise someone from the dead. He predicted a drought. He is used by God to confront the prophets of Baal when God reigned down fire. God spoke to him outside a cave with a low whisper. Elijah is taken up to heaven with chariots of fire and horses of fire. Elijah an enemy?!? The word Ahab spoke—enemy—in Hebrew means adversary, enemy, and foe. Why did Ahab use this word? Why did Ahab see Elijah as an enemy? Look at Elijah’s response; it says a lot. He said, “I have come because you have sold yourself to what is evil in the LORD’s sight.” Truth. Elijah spoke truth. That is what made him an enemy. Evil hates truth. When we boldly stand for the truth, we will find ourselves to be seen as the enemy. It doesn’t mean we are in the wrong, but that we are shining a light—the Light—in a dark world, a world that hates the light. John 3:19-20 states: “And this is the judgment: the light has come into the world, and people loved the darkness rather than the light because their works were evil. For everyone who does wicked things hates the light and does not come to the light, lest his works should be exposed” [ESV]. King Aram told his commanders not to fight with anyone except Ahab king of Israel but King Ahab had a plan to foil any possible injury. He decided he would wear a disguise in battle. To throw the people off of him, he told Jehoshaphat to still wear his royal robes. Off they went into battle. When first reading this one would bet that King Ahab would get away with this deception and King Jehoshaphat would meet his doom. It has the perfect storyline for a television or movie action sequence with the antagonist plot and this somewhat innocent ally. But God intervenes. The commanders see that they were chasing the wrong man. Even more, someone randomly, yes randomly, hit the king of Israel, right between the breastplate and his scale armor. That is not an easy shot. What does this say to us? The prophet Micaiah spoke out against Ahab, prophesying doom when asked if the kings should go to war against Ramoth Gilead. The Word of God stands always. There is no hiding from the Truth. God will see His work to completion. Jehoshaphat followed God and his obedience brought him wealth and honor. Even so, there are times when we can make some poor decisions that can end up pulling us away from God. Jehoshaphat’s poor decision was making bad alliances. 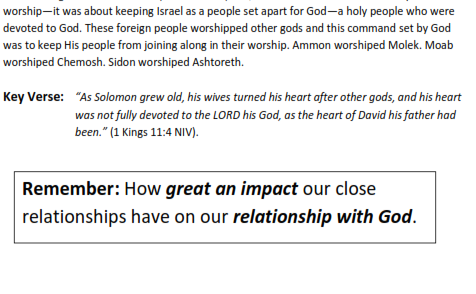 In 2 Chronicles 18, we read about the first bad alliance. This was a marriage alliance involving Jehoshaphat’s son Joram to King Ahab’s daughter Athaliah. King Ahab was very far from God. As Ahab and Jehoshaphat aligned together, Jehoshaphat was nearly killed if not for the protection of God. The second alliance was a trading alliance Jehoshaphat formed with King Ahaziah. God responds with smashed ships unable to trade. We are never to isolate ourselves from others. How would the Gospel spread if we hide ourselves away? Nonetheless, we need to be cautious of our alliances. Not only can a bad alliance crush our moral authority, but it can lead us away from God. It is so important to surround yourself with strong Christians for encouragement, support, guidance, and comfort. Every time I read today’s verse, I ask myself why Jehoshaphat would even go with Ahab into the battle with this request. Ahab decides to disguise himself so he would not be recognized. Yet he tells Jehoshaphat to wear the royal robes so everyone can tell that he is the king. Something happens though—things do not go as Ahab was hoping. Ahab was hoping his disguise would save his life. If anything, Jehoshaphat would be targeted due to his attire. But Ahab couldn’t understand that God’s plans cannot be thwarted. You can hide. You can dress differently. You can do whatever you like to avoid something, but God sees you and His plan cannot be thwarted. Not only was Ahab hit, but Jehoshaphat was kept safe. Remember that you cannot wear a disguise in front of God. He knows your inward parts. He knows every piece of your life. He knows everything about you—things you might not yet know. So don’t put on a foolish disguise. You’re not fooling Him. Micaiah prophesies against Ahab. Whenever the king of Israel consulted with him, it was always trouble. Nothing but trouble. Ahab did not like to hear what Micaiah would say—all this trouble. The problem was the way he was living was the reason for the trouble. Ahab did not like to hear the truth. It was clear to see that because Ahab was not following the ways of the Lord, he was facing these troubles. Nonetheless, Ahab felt that he could get better news delivered from someone else. You’ve heard the statement – “You can’t handle the truth.” Well Ahab couldn’t. It meant that life wasn’t all about him. It meant change. It meant sacrifice. Today are you in the same denial? Do you avoid certain people because they speak truth? One of my favorite books of the Bible is 1 Kings. Not so long ago I was led to make a Bible study for the book and it was a great journey through God’s Word. We are introduced to Elijah in 1 Kings and we see a lot unfold. From the moment he is on the scene, we are not provided much of an introduction into his life, but we slowly see this picture of Elijah revealed through the drought, the time with the widow, and the magnificent display by God at Mount Carmel. Now Ahab describes Elijah differently than most of us would. He called him a “troublemaker.” A troublemaker. Most of us would not call Elijah a troublemaker. He was following God’s commands. He was anything but a troublemaker. But to Ahab he was a troublemaker because Ahab was not following God’s commands. What Elijah was doing was causing trouble for Ahab and his evil ways. In the same way, people might see Christians as troublemakers. We stand firm and uphold the Word of God but that goes against what society desires. The world wants what the world wants. So you might be called a “troublemaker.” Just remember that there are two types of troublemakers. There are troublemakers who are simply standing firm on God’s Word so they appear as the disorder amidst the world. Then there are the troublemakers who are against God’s Word and are living a life filled with evil. Ahab saw Elijah as a troublemaker. We see Ahab as a troublemaker. The difference is—one is following God’s Word and the other is not. Where do you fall? This book is a 10 Session Bible Study book great for both individual study or group Bible study. 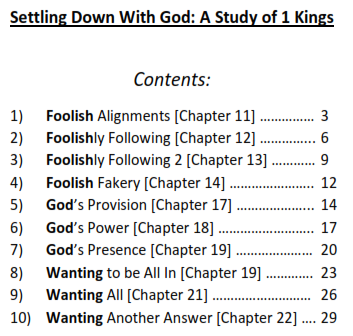 I just finished working on this new project, Settling Down With God: A Study of 1 Kings. Funny enough, when God gave me the title, I initially thought that He wanted me to write about coping with AdHd in a biblical manner, because AdHd is something that both my daughter and I have learned to deal with over the years. Nonetheless, I waited for His direction and later learned that I was way off course. I was very excited to dig deeper into 1 Kings for this project, as it is always a book I enjoy reading. There is so much there; I am always amazed. For my first three books, and my 4th book (the Daily Good complimentary 14-day Devotional), I actually used my own personal photography. Each of the photos on all four of those books were taken in Australia. I wanted to do things differently this time around. My daughter is quite the artist and I asked if she could design the book cover. She merely was told that it was a Bible study book on 1 Kings. As my daughter completed the book cover, I was working on the text. When we both were finished, my daughter sat by my side and helped to edit the cover till it was as she thought best for her vision. She told me that the puzzle pieces were used on the cover because it represents how each one of us is a special piece, we each are different, but we belong to one body. Then she said at the same time, our lives are made up of different pieces. I was so impressed by what she has already learned so far, to see her vision brought to life, and to work with her on this project. 2 Kings 3 Bible Study: Are You a Ditch Digger? This lesson is a Bible Study Lesson on 2 Kings 3: Are You a Ditch Digger. This lesson is geared toward youth and adult Bible study groups. King Mesha made a promise to King Ahab regarding a tribute to pay. When King Ahab died, King Mesha decided he would not keep his promise. Was there a moment when you did not keep your promise? What happened because of this broken promise? King Jehoshaphat was considered a good king, but what poor choice did he make that got him into trouble? Have you made a similar choice? Bad company corrupts good character. Could King Jehoshaphat have done things differently to still help King Joram out or was there no good way to move forward with helping him? Download complete lesson 2 Kings 3 Bible Study: Are You a Ditch Digger?